I'm looking forward to a new bunch of challenges at The Paper Players this year. Our first challenge will give you a bit of a giggle. 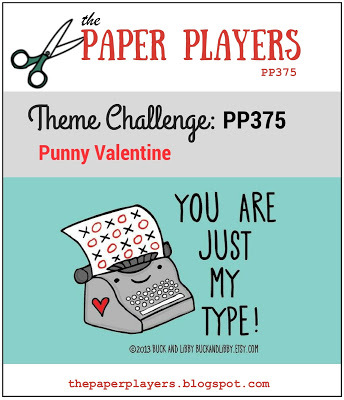 It's a theme challenge: Punny Valentine. This one is a real mixture of bits and pieces. The flowers are from Touches of Texture. 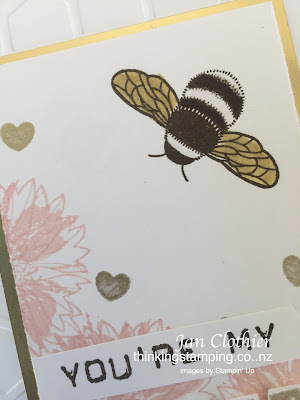 The fabulous bumble bee is from Dragonfly Dreams. The lettering and the hearts are from Labeller Alphabet. The hexagonal embossing adds some theme-related texture. The bee has his wings glammed up with some gold Wink of Stella and his white bits with clear Wink of Stella. We'd love to have you join us at The Paper Players this week. Here's a reminder of the rules of the challenge. I truly commend you for being able to photograph your gold foil so well! I struggle with foil and Mirrarcard. Honeybess is just perfect! Jan this is so sweet (pun intended)! 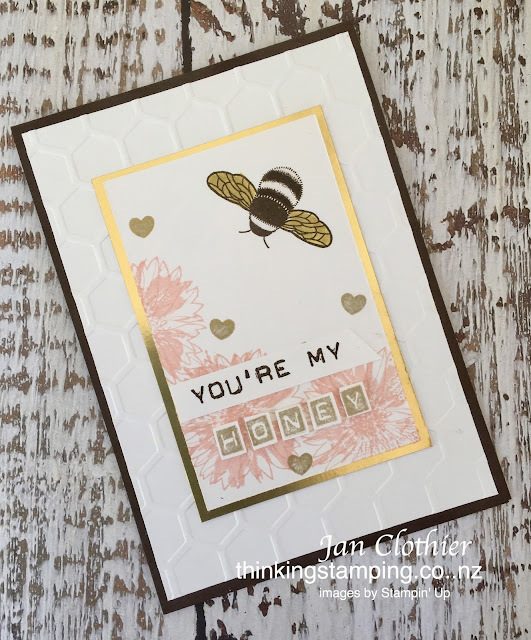 Love the little bee and sentiment, and how you repeated the theme with the honeycomb background. 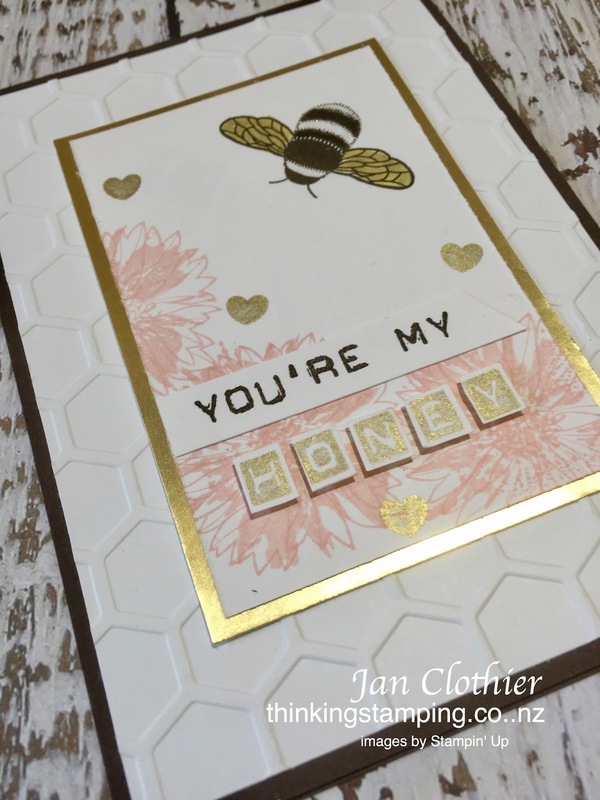 This is sure to make your honey smile! So pretty with the gold, and a sweet pun too! Punny and beautiful at the same time! Have a great weekend and congrats, Queen of Clean! Oh how sweet is this?! Love that fat and sparkley little bumblebee. The soft colors are so pretty with the touches of gold and I love your punny sentiment. Just perfect, Jan! Jan this beautiful! 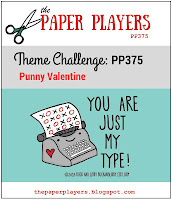 A great use of a non-Valentine set to create something punny and so pretty too! 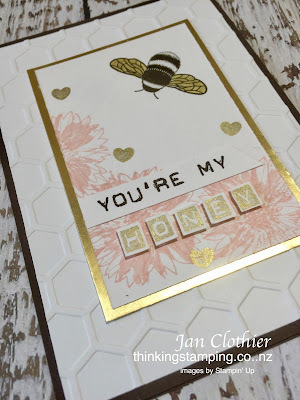 I love the flowers and all the gold, topped off with the perfect honeybee - just fabulous!